I think I have it figured out (at least as far as my ankle is concerned). And it goes by the name of Anterolateral Ankle Impingement. It has been over 5 months since my sprain and I have had no real improvement in my ankle in probably 2 months time. Running on paved surfaces is mostly good, though my ankle tends to start muttering at me by 7-8 miles into most longer runs. This is not what bothers me. What bothers me is how weak and twinge-y my ankle feels any time I run on non-paved surfaces (like the gravel shoulder or grass). 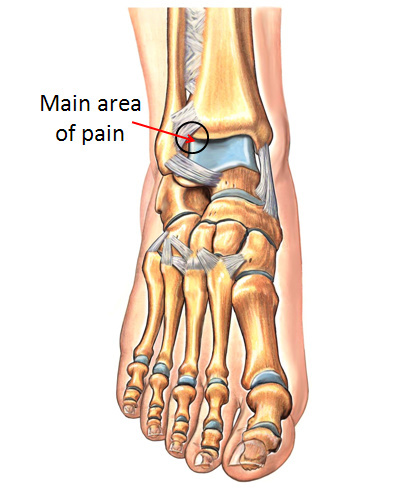 It feels weak and it hurts sort of from the top of where my ankle and foot meet to around and under my outer ankle bone. I also cannot do much dorsiflexion beyond normal walking or running without awful stiffness and pain. I really can't stretch my achilles on my left side, so it's a good thing that I'm not prone to achilles issues. From the look of things I pretty much have textbook symptoms of the afore-linked condition. And right now I'm just really thankful that our roads are still clear. At the moment I'm fairly certain that running on snow is going to be very bad. I'm also guessing that any trail running in 2011 is going to be no-go. I have a routine asthma check-up with my PCP in 2 weeks, so I'm going to ask him about this issue then. My guess is they may schedule me for an MRI and once the condition is confirmed we'll try some corticosteroid injections at the site of the scarring. If that doesn't help, then I'd likely be looking at surgery. I guess the timing could be worse. If I have to lose a few months of running and biking to surgical recovery, Winter is not the worst time to do so. Since I'm already assuming that trail running will be out for next year, I'm thinking that 2011 might be my year to really embrace the duathlon and shorter distance road races. Ever since my first (and, thus far, only) duathlon back in April I have REALLY wanted to see what I could do in the 5k. The first leg of that duathlon gave my my 5k PR...just imagine what I could have done without having to pace myself for the subsequent bike and 2nd 2k legs! I think I am going to forgo the May 25k, too. Last Spring it was really difficult to train properly for both that and the duathlon--they are just such different events with training that is often at odds. I would like to dedicate more bike-specific training to my workouts, instead of so many longer runs, especially now that I'm more comfortable on the bike and will have a new, more performance-oriented ride with which to become more familiar. More bike time in the Spring will also make it easier to potentially do a few century rides in the Summer, as well as a Summer duathlon or two. And the bike doesn't bother my ankle...at all. So my running mileage may be a bit light depending upon the long-term ankle prognosis, anyhow.